I came across a great tutorial on artificially aging wood over here at Xrestore, a clock restoration site. Combine this treatment with some careful physical distressing and you can convert a cheap craft box from Michael's or the Hobby Lobby into an ancient coffer suitable for all kinds of eldritch artifacts. While I appreciate the link from Behind the Pallid Mask, I do have to admit I found some of his dreams somewhat disturbing. Then again, that's rather the point of his blog. If his planned scenario is half as good as some of his dreams are it's going to be a must-have. 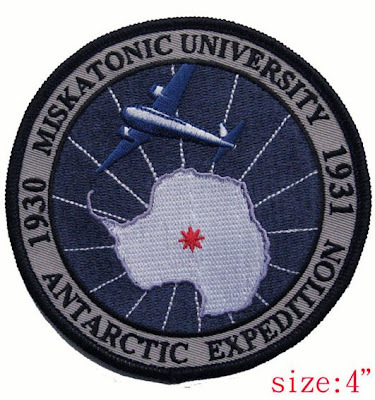 Here's the final sample of the ATMOM expedition patch in physical form. The project was slightly delayed because there were some small problems with the initial embroidery patterns, but those were easily fixed thanks to the great folks at the company that's actually producing the patch. Just click on the picture to see the full-sized scan.